In the first of a three-part interview, Dr Phil Clark talks to Think Africa Press about transitional justice in Rwanda, Uganda, Congo and South Sudan. 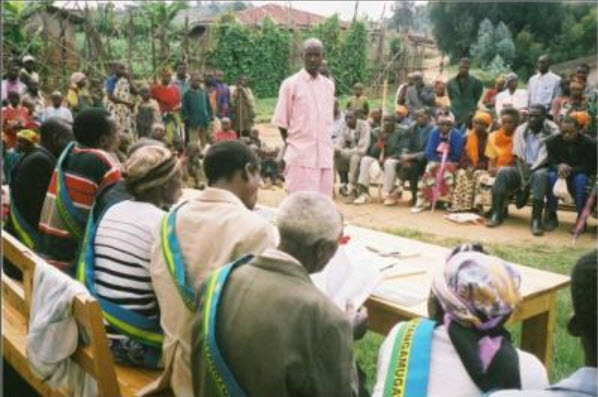 A man gives evidence to a gacaca court in Rwanda. How do you think that the failure of the gacaca courts to address the crimes of the Rwandan Patriotic Front (RPF) – after taking Kigali in 1994 and also later in the DRC – will affect longer-term stability and reconciliation in Rwanda? I think this failure to deal with RPF crimes is one of the biggest problems that the gacaca process has brought up. It’s not talked about a lot in the literature on gacaca, but the population discusses RPF crimes explicitly during many gacaca trials. You have an RPF government, which is obviously very worried about people talking about RPF crimes in open spaces. But, especially on the periphery of Rwanda, gacaca has created a space where the population regularly talks about RPF crimes in a very public and comprehensive way. This is quite revolutionary in terms of Rwandan politics. The problem is that as people have talked about these crimes openly, there has been an expectation or a hope that gacaca would also prosecute RPF crimes – and that hasn’t happened. A great deal of frustration has been borne out by this process. It means that, in the long term, gacaca hasn’t delivered even-handed justice. It has been very comprehensive in terms of dealing with genocide crimes but has, in a prosecutorial sense, not dealt with the other side of the equation. This is a running sore for the Hutu majority, and the legacy of it will be that much of the Hutu population will look back on gacaca and see it as one-sided justice. In my opinion, there is no doubt that this will harm the long-term cause of reconciliation. This isn’t to equate genocide crimes and RPF crimes in moral terms – I think there is an important normative distinction between genocide and crimes committed in revenge following genocide – but the failure to address the latter is nonetheless problematic. How exactly are gacaca judges supposed to deal with these issues when they arise? According to the Gacaca Law, when crimes committed by the RPF come up during trials, how are judges supposed to treat them as evidence, especially in their final judgments? The Gacaca Law is quite strict in terms of the types of crimes that can be prosecuted through gacaca. There is an emphasis on genocide crimes, which are strictly defined to ensure that gacaca does not prosecute RPF crimes. The nature of the atrocities and also the timing of those crimes in the Law ensure that RPF atrocities are almost never formally brought to the courts as criminal cases. It is left to the judges to use their own discretion in terms of how they deal with RPF cases if they arise in community discussions. Most judges know fully well how opposed the government is to looking at these particular crimes. What judges tend to do is tolerate the open discussion without actively encouraging it. They tend not to record that evidence once the trial is finished because, of course, judges are concerned that if they transfer the transcripts of the trials back to central authorities and it becomes known that they have allowed open discussions of RPF crimes then they themselves could get into trouble. What goes on during gacaca trials is a reasonably well-hidden secret in a lot of communities. You get a sense from the human rights literature on gacaca that the process is nothing more than an attempt by a draconian government to control the entire country. Gacaca is usually talked about these days as a tool of centralised power and an attempt to subjugate the Hutu majority. But, particularly in communities on the fringes of the country, gacaca has actually become much less predictable than that. The government may have had certain intentions when it created this justice process – and even those intentions were highly varied – but once it got rolled out to the entire country, communities started to take ownership of the process in ways that the government may not necessarily have agreed with. Pockets of resistance emerge as the process unfolds – it is an important development that most commentators on gacaca have completely overlooked. One of the reasons for that is that a lot of the commentary on gacaca tends to focus on communities very close to Kigali, and tends to focus only on state agency rather than popular actions within the confines of the state. But some of the more interesting developments have happened in places far flung from the capital where state influence decreases. In the areas adjacent to the Kivu regions of the DRC, places like Gisenyi and Ruhengeri? Yes, in the northern borderland jurisdictions and also in the far South, in communities where there is less of a government presence at gacaca meetings. It is true that the Rwandan state is heavily centralised, but it is also a very limited state in terms of resources and so it cannot extend its influence into all places at all times. There are some very important regional differences in the way in which this trial process has unfolded. Closer to Kigali, both judges and the population are very careful about what they say. You see a greater physical presence of government officials in those communities. On the fringes of the country the community is often much freer to talk in a way that people closer to the capital are not. There is a great diversity of communities that have very different experiences of gacaca. In those peripheries where open discussion is more necessary for the community – and hence more tolerated by judges – have the strictures placed on the judges when recording the evidence from a case affected their moral authority? They haven’t because the bulk of the population understands the rules of the game. There is an understanding among most participants in gacaca, as well as among the judges, that recording this evidence would create problems for everybody. Typically there is a sense among the general population that actually the judges are doing them a favour by not recording these things. The purpose of people talking about RPF crimes outwardly is really not so much to send a message to central authorities – because people could get into trouble for that – it is more to articulate a concern within the community itself. For many years people have not been able to talk about these things openly. Gacaca has created a space where at least a community conversation on these issues is possible now. Now I don’t want to overstate how many communities permit this kind of discourse. I have looked at gacaca in around 20 communities in five different provinces over a period of eight years, and out of those 20 communities these crimes are talked about regularly in 20 or 25% of those. It is certainly not in a majority of places. But it is a significant enough trend to suggest that some important and unexpected things have been going on within the gacaca framework. Does this mean that the UN Mapping Report – both when it was leaked and when it was released officially – did not really affect the internal machinations of the courts and what the populace already knew? Has its primary effect been on the RPF government by changing the terms of engagement with the international community? The UN Mapping Report didn’t tell the Rwandan population anything it didn’t already know. Nonetheless the Report has been very damaging to the Rwandan government because it relies so heavily on a good international reputation. One of the bases of the RPF’s power in the last ten or 15 years has been unswerving support by the UN, the US and the UK in particular. They are the major backers. Their support has meant that the Rwandan state could do almost anything in the knowledge that those parties were in the background supporting it. The UN Mapping Report is damaging in that regard. However, the report itself is problematic for numerous reasons, and there is a growing sense of critique of the report, particularly in terms of its methodologies. The threshold of evidence for many of the report’s claims is very, very low. Really, there is no difference between the standard of evidence required by the report and that required by a journalist operating in the region. To my mind, that is not good enough given the UN expertise that was available and the political ramifications of a report like this. The fact that the report uses the term ‘genocide’ at all requires it to have used a very high threshold of evidence – and it has not done that. The report is much sketchier than a lot of people have recognised, and I think the Rwandan government has a legitimate claim when it points this out. But nevertheless the fact that the report has been disseminated as widely as it has, and that the UN is standing by it, does cause major political fallout for Rwanda.